Follicular Unit Extraction hair transplant surgeries are in high demand. Yet they are very time-consuming due to the reliance on tiny punches for removing individual follicular units. Also when using these instruments, there is the risk of human error leading to damaged grafts. Dr.UGraft technology overcomes these challenges by enabling smoother, faster procedures to produce better grafts for hair transplant success. Hair restoration patients require donor graft counts in the thousands to achieve their desired end coverage. Surgeries need to be extremely efficient as they aim for both speed and high graft quality. Slow extractions will enhance the experience of tedium as well as fatigue for practitioners which can lead to increased errors. Therefore speed is important, not only to score around each graft, but also to ensure that follicles promptly receive the hydration they need to survive. DrUGraft FUE Swipe maneuver which brings out a number of the grafts by simply swiping the area of the scored grafts with a wet piece of gauze. Successful hair transplants are defined by quality coverage. However, there are many instances when patients continue to suffer from baldness and thinning due to poor yield. The primary causes of these unfortunate outcomes are due to injured or damaged grafts that are not able to survive. Dr.UGraft™ punches are intelligently designed to overcome the issues that undermine the health of donor follicles. The foot pedal control provides an unprecedented smoother and easier system for achieving this goal, allowing surgeons to focus on their extractions. Impacted grafts and debris are ejected without having to stop procedure. When grafts are extracted and still at the point of being attached to the skin, they may get stuck inside the punch. The rotational motion causes them to become twisted due to torsional forces. And close contact with the inner punch lining creates frictional heat which further damages the follicles. This punch is designed with an expanded inner volume which affords more room for the graft to ascend upward into the punch, preventing it from being subject to heat frictional forces and the rotational twisting of the device. Concurrently, the outward edge cuts around the graft unit as the upward pulling motion works to separate it from its surroundings and detach it from the skin to prevent it from the risks of torsional rotation. Also the ability to draw fluid to the punch tip allows the inner surface to then become lubricated also serves to protects the follicles from frictional damage. Another hallmark feature of Dr.UGraft’s intelligent extraction device is the patented and patent-pending graft gripping and pulling designed features. This compliments the process of separating the graft from the skin through scoring, helping to fully liberate it. Since torsion occurs as the graft is still attached to the skin, the ability to fully separate the follicular unit from its surroundings is essential for preventing torsional damage. Misaligned punches due to human error lead to grafts themselves coming into contact with sharp cutting edges. Dr.UGraft’s intelligent rotary punch avoids this issue as a result of the flared punch end. Flaring allows the sharp cutting edge to be directed away from the follicle. What touches the graft is a dull, smooth, non-threatening surface. Uninjured follicles are naturally better grafts for hair transplant success. And with this safety measure in place, patients are able to benefit from a greater number of usable donor follicles. Patented graft control features, combined with the aid of the smooth surface helps the graft ascend upward. The upward pulling dynamic overcomes any type of hair graft angulation, placing the focus on the tissue around the follicular unit and not the navigation of hair angles. With these features, practitioners can spend less time trying to correct the alignment of their punch relative to the hair follicle. Most specialists in linear scar free hair transplants rely on external devices for depth control. When using tiny punches, it is important to avoid advancing these devices too far into the skin. This can lead to transection and impacted grafts which ultimately waste a patient’s limited supply of donor follicles. Depth control has been achieved through the use of external devices which often has to be adjusted during the procedure, especially as the extractions are performed on different scalp terrain regions and for different hair characteristics. With typical depth control measures, follicles need to be measured to determine the average maximum depth of the punch. With this information, the surgeon is then able to adjust the plastic sleeve marker on the punch. Additionally, the design of the external wall expansion of the Dr.UPunch i ™ helps the device encounter resistance as it moves downward into the skin. This dynamic also serves to control the depth of the instrument. With innate depth control, practitioners do not have to spend time trying to gauge how deep he/she can go with each score. Ideally, retaining tissue bulk contribute to better grafts for hair transplant success. Dr.UGraft’s flared punch tip is a crucial design feature which enables this. The flaring allows the device to exert an outward cutting vector that expands the scored area beyond the actual circumference of the punch. Therefore, this feature allows the instrument to gather more tissue around the follicles within a graft unit, contributing to greater bulk. 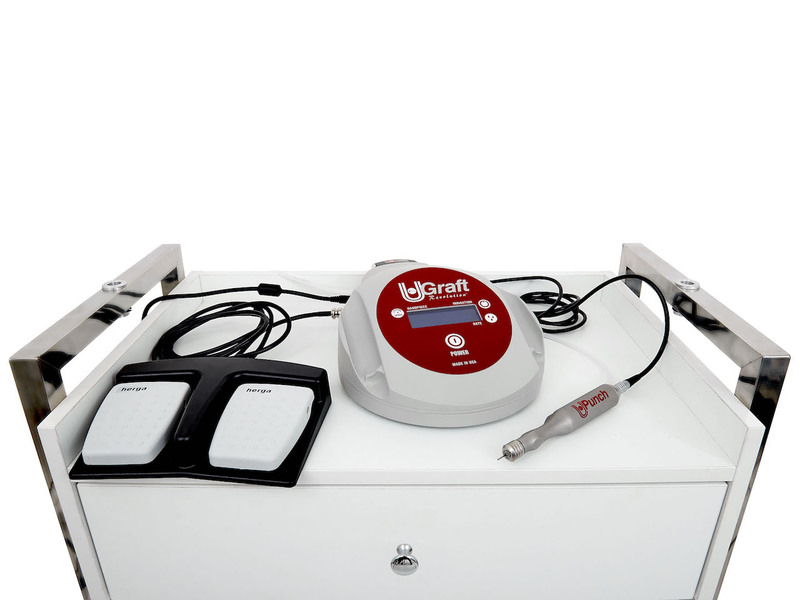 Due to the ability of the Dr.UGraft’s intelligent punch to pull follicular unit grafts upward, this features allows the device to easily extract hairs at different angles, orientations, and directions and trying to account for ever-shifting graft alignments. Therefore, practitioners can spend less time trying to align their punches while having to adjust their posture and positioning of themselves as well as the patient. Watch the video below to see the Dr.UGraft™ system in action on several of the features listed above. The Dr.UGraft rotary devices separate follicles from their tissue attachments. Grafts can be retrieved very rapidly with the FUE Swipe maneuver. This reduces to time they spend out of body and improves hair transplant graft quality. Click here to learn how to become a Dr.UGraft provider. How does Dr.UGraft™ allow for a faster procedure without sacrificing hair transplant graft survival? 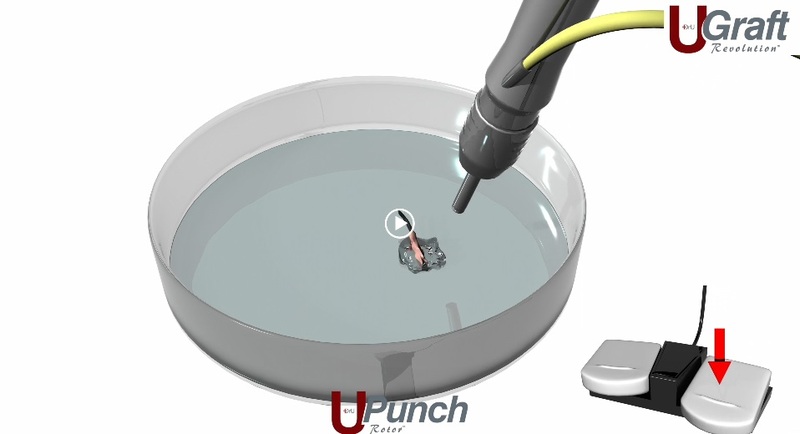 The Intelligent Punch (Dr.UPunch i) simultaneously cuts away from the encircled graft and pushes away attachments, allowing grafts to “pop” out of the donor area. This easy detachment allows grafts to be collecting via the Dr.UGRaft Swipe Maneuver, which saves the physician and medical team from having to collect all grafts individually with forceps. The quality of grafts is improved by the decreased instances in which mechanical tools are required to collect grafts, as well as the integrated fluid system, which helps prevent desiccation, one of the most common causes of graft failure. In addition to better quality grafts and efficient extractions, what other factors lead to successful hair transplant outcomes? Discover how Dr.UGraft™ overcomes wideness of follicular units for fuller hair transplant coverage. 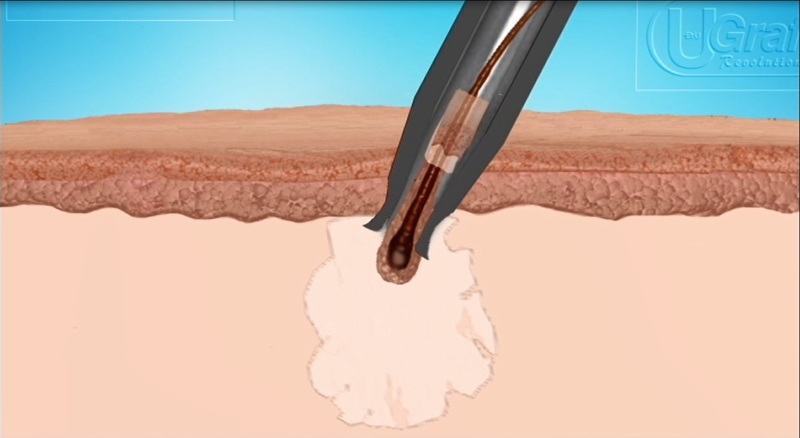 Learn how Dr.UGraft™ enables better linear scar free hair transplant donor wound healing.